Sam Edwards grew up in a show biz family. 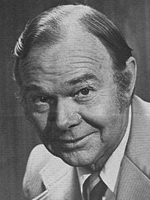 He acted on Sunny and Buddy and his family's show The Edwards Family. Sam Edwards (May 26, 1915 – July 28, 2004) was an American actor. His most famous role on television was as banker Bill Anderson on Little House on the Prairie. He appeared on radio in the 1930s in the Adventures of Sonny and Buddy one of the first radio serials ever syndicated, and later in The Edwards Family. Edwards' first major screen role was as Chuck Ramsey in the movie serial version of Captain Midnight (1942). From 1949 to 1981, he made several film appearances, with significant roles in Twelve O'Clock High (1949), Operation Pacific (1951), Gangbusters (1954), and supporting roles in The Beatniks (1960) and Suppose They Gave A War and Nobody Came (1969). He was also seen in The Absent-Minded Professor (1961), Hello, Dolly! (1969) and The Postman Always Rings Twice (1981). Edwards appeared on many television series starting in the mid-1950s. Most notable of these include many episodes of Dragnet and Gunsmoke throughout their long runs. He also appeared on over 60 different series, including The George Burns and Gracie Allen Show, The Andy Griffith Show, Petticoat Junction, Green Acres, Mannix, Mission: Impossible, The Streets of San Francisco, Adam-12, The Red Skelton Show, Happy Days, The Dukes of Hazzard, and even Days of Our Lives. As a voice actor and radio veteran, Edwards was also often heard behind animated characters both on film and records. In 1942, he voiced the adult Thumper in the animated classic Bambi. Later work for Disney was largely on LP Records, including the voices of the Cowardly Lion and Tin Woodman on their Oz series, and as the bouncy Tigger, Rabbit and Owl on the Winnie the Pooh records. He voiced the title character of Rod Rocket in an early 1960s educational series and did some episodes of the cult classic Jonny Quest. His last work for Disney was as Ollie Owl opposite singer Burl Ives as Sam the Eagle on their long-running America Sings attraction at Disneyland. There were numerous TV and radio commercials as well, both in front of and behind the camera.